A total of 18 civilians tortured under an Iraqi war operation involving a Danish battalion have been awarded compensation totaling DKK 30,000 ($4,600) each. The Danish government, however, aims to appeal the verdict. Defense Minister Claus Hjort Frederiksen of the ruling Liberal Party has appealed the court ruling forcing the Danish government to pay damages to Iraqi civilians who were tortured in 2004 during Operation Green Desert, despite Danish participation in the operation, the newspaper Politiken reported. Claus Hjort Frederiksen argued that the decision placed Denmark "in a difficult situation." "This means that we can no longer contribute to improving security, and therefore guaranteeing human rights, in countries engaged in armed conflict," Claus Hjort Frederiksen said, stressing his satisfaction with the verdict exonerating the Danish soldiers from torture. In total, 23 plaintiffs sued Denmark after being arrested and subjected to "torture and inhumane treatment" in Operation Green Desert near Iraq's main port of Basra, in which a Danish battalion participated. The plaintiffs demanded DKK 120,000 in damages ($18,700). The Appeals Court in Copenhagen ruled that although the Danish soldiers never joined the torture, they still failed to prevent the abuse, thus awarding 18 of the 23 plaintiffs DKK 30,000 ($4,600) each in damages. "The soldiers of the Danish battalion who were sent to Iraq in 2004 and partook in the operation were not found guilty of violence committed against the Iraqis," the court ruled. However, the judges also found that the Danish personnel were fully aware that the prisoners faced a "real risk" of being physically abused by the Iraqi security forces. Although there was no evidence that the Danish battalion could have predicted the extent of the ensuing "systemic torture and violence," it still failed to intervene. Denmark, a fixture in NATO's overseas operations, decided in 2003 to support US military involvement in Iraq and contribute naval assets to the war. The Danish ground contingent Dancon was deployed to Iraq between June 2003 and July 2007, peaking at about 550 men. 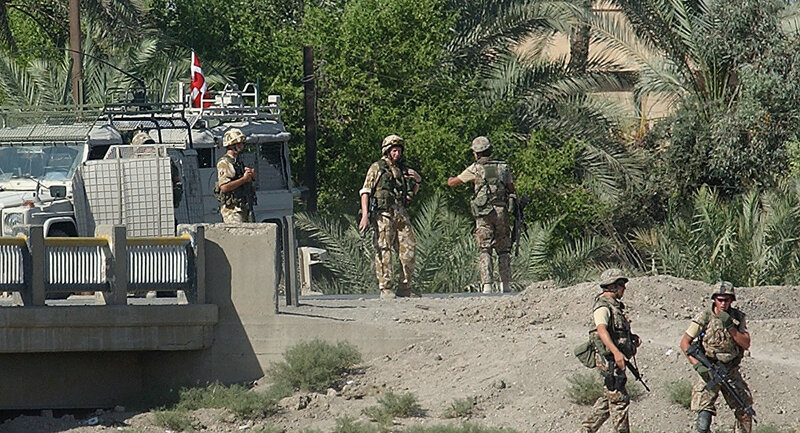 Denmark's military involvement in Iraq was estimated to cost DKK 2.4 billion ($370 million). Since October 2014, Denmark has been back in Iraq participating in military strikes against Daesh and training Iraqi troops to take on Daesh themselves. In mid-May 2018, Denmark pledged to pull around 60 special troops from Iraq, as most areas once controlled by Daesh had been liberated. The gradual pullout will conclude in late autumn. Denmark will still have around 180 military personnel posted to the al-Asad air base in Iraq, and contribute to radar surveillance as part of an international coalition fighting the Islamist militant group.